A great reason to celebrate St. Valentine's Day! The real St. Valentine was a champion of true love, a Christian bishop with a strong faith. He was imprisoned and sentenced to death for helping Christian soldiers to marry. This was against the orders of Roman Emperor Claudius II who had outlawed marriage because he believed that the result would be stronger and better soldiers. While St. Valentine was in prison, Asterius his jailer, asked Valentine to use his faith to heal his daughter, Julia, who was blind. As a result both Asterius and Julia were converted to Christianity and Valentine fell in love with Julia. The night before his execution he left a final note for Julia and signed it, “from your Valentine.” Sadly, he was executed on 14 February, 270 AD and buried at the Church of Praxedes in Rome. It is said that Julia planted a pink blossomed almond tree near his grave and that it is still there today as a symbol of lasting love and friendship. Take a look below to learn more about the great FREE resources we offer to assist your family or ministry in celebrating real love at Valentine's! Valentine's Day is a great time for children to learn that there's more to love than hearts and candy! 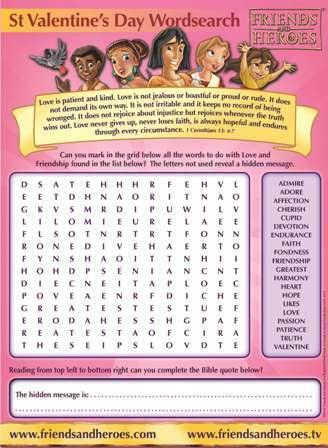 Your children can have fun and dig into what the Bible says about real love in 1 Corinthians 13 with our Valentine's Wordsearch. Remember the real reason to celebrate with our St. Valentine's Day Bible Flashcards. Both are our FREE Valentine's gift to your family. Based on the song "What about Love?" from our music CD What about Love? this video is beautiful and moving for children and adults alike. Plus, it reminds us of God's love for us, which gives us all a real reason to celebrate this February. Learn more about our music CD What about Love? NEW! Stream "What about Love?" in HD FREE on Amazon Instant Video and Amazon Prime!